The acting may be bad, but the hardware shows that someone did their homework. Click here for action shots of Apples, IBMs, the Altair 8800 and more. This one has two floppy drives! Fancy! It was the hardware that kept my eyes glued to the American Genius: Jobs vs. Gates documentary that aired Monday night. Someone did a good job of collecting vintage PCs and other high tech of 30-plus years ago for the show. These machines shared the screen with (and sometimes upstaged) the unknown actors in this unremarkable dramatization. We saw Apple and IBM hardware, of course, but also other old names, like Altair and Digital Equipment Corporation and—Zenith Data Systems?! Oh, the memories! For all our fascination with the latest and greatest, old tech can inspire astronomically high prices as well as good ol’ nostalgia. Even if you missed the show, you can see the best stuff right here. Remember Digital Equipment Corporation? DEC and other companies along Route 128 in Massachusetts rose during the heyday of mainframe computing, with products like DEC's KL-10, shown here. 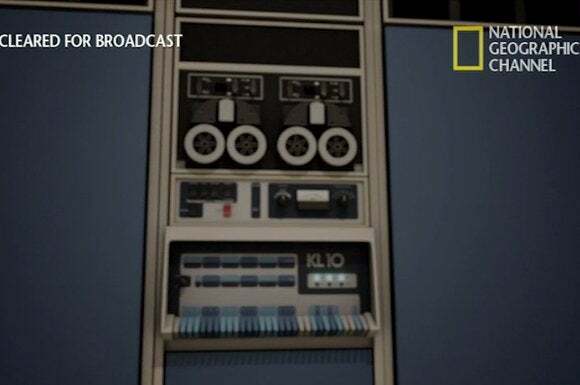 Mainframes were huge and powerful, managed by trained professionals who programmed using codes entered on paper or magnetic tape. Looking at it now, the blue keys at the bottom make it look like a church organ (another old-timey instrument). In the mid-70s, personal computers were a hobby for tinkerers with soldering guns. One such enthusiast was Steve Wozniak. 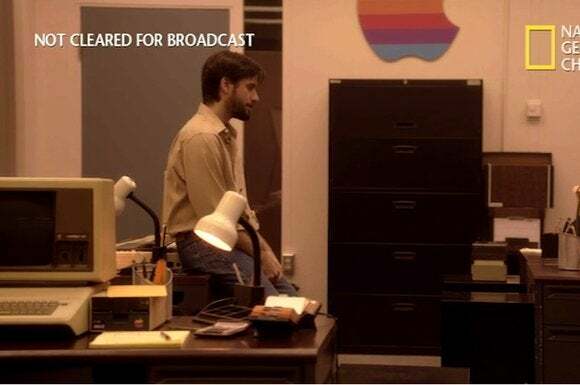 In this scene from Jobs vs. Gates, Woz is showing his friend Steve Jobs how cool it would be to attach a keyboard and a monitor to a computer so you can input data into it directly, rather than feed a punchcard into a mainframe. Look at the old, fuzzy display with the green text! Look at all those transistors on that huge motherboard! Look at all the cables! These people even had to get up and walk over to the television to change the channel. 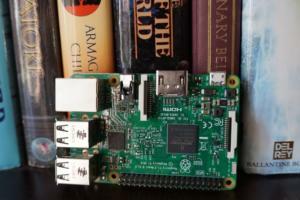 From these humble technical beginnings, a new computing era rose. 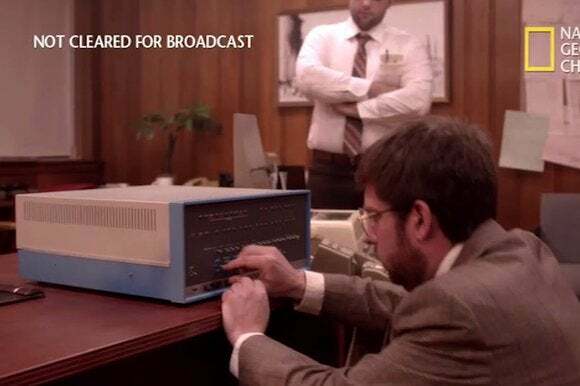 In this scene from American Genius: Jobs vs. Gates, Bill Gates' partner, Paul Allen, fiddles with an Altair 8800, the first microcomputer (that is, it could fit on a desk instead of in a room). 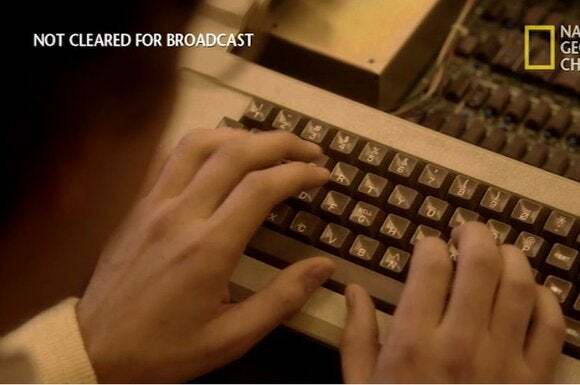 The Altair didn't come with a monitor or a keyboard, but Gates and Allen figured out how to write the first software program to run on it, called Altair-BASIC. Apple's original computer didn't sell very well, but the self-contained Apple II, with a keyboard and monitor, was a big hit. 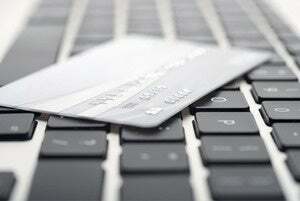 The computer couldn't run business software, however, so Microsoft developed its SoftCard expansion board to add that capability. In this scene, Bill Gates is typing on the Apple II as he demos the SoftCard to an impressed Steve Jobs. Microsoft bought the 86-DOS personal computer operating system from Seattle Computer Products, renamed it MS-DOS, and the rest is history. 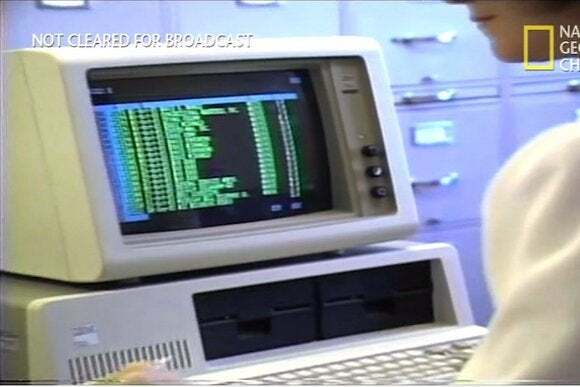 In this scene, Bill Gates removes a 5.25-inch floppy disk containing DOS from a Zenith Data Systems computer (you can juuust see the logo in the lower right), before he writes a check to an eager programmer. All I can think is, wow--at this time, around 1980, that floppy disk most likely had a capacity of 360KB. IBM sold millions of computers like the XT PC pictured here, after the machine launched in the early 80's. As you can see on the screen, its business applications are purely text-based, though this display has color, which is nice. I remember distinctly how you could identify power users because they had two floppy disk drives instead of just one. Despite the Apple II's success, Steve Jobs knows it still needs something more. 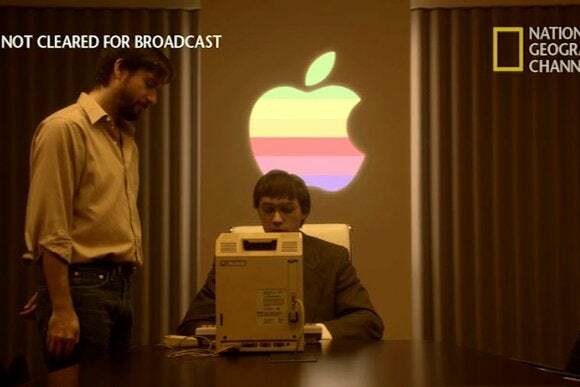 As he deliberates in this scene from the documentary, you can see an Apple II with an external 5.25-inch floppy drive on the desk at left, as well as a partial shot of Apple's old rainbow-colored logo on the wall. When Steve Jobs saw Xerox's Star 8010 Information System, he quickly adopted its graphical user interface and mouse for the next generation of Apple's computers. In this image, you can see the black cursor arrow settling over an onscreen folder representing a collection of files. 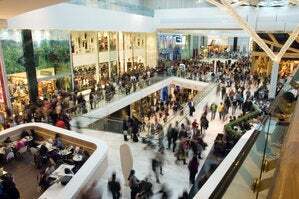 Sounds obvious now, but it was a dramatic change from the text-based computing already in use. No, this isn't a painting on the ceiling of the Sistine Chapel: This is Steve Jobs, guiding Bill Gates' hand onto the mouse that runs Apple's new Macintosh computer. Apple still uses a single-button mouse, though third-party mice and PC mice feature more controls. 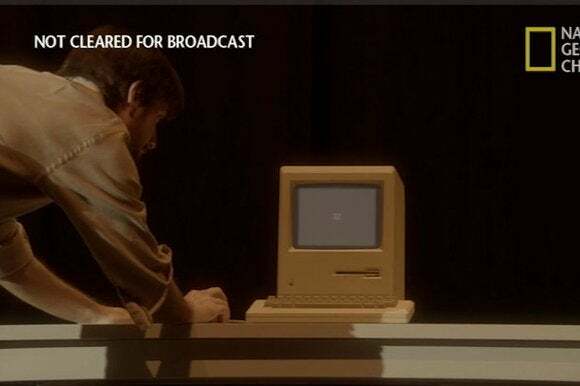 In this dramatization from Jobs vs. Gates, Steve Jobs introduces the Macintosh to a thrilled crowd. It says a little speech, and cute graphics cross its screen. 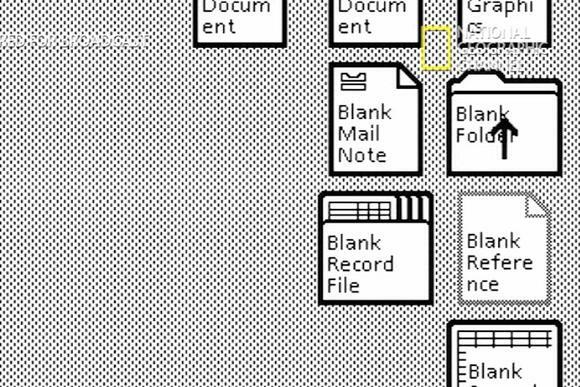 Its compact, convenient design and graphical user interface contrast sharply with the hulking, text-based IBM PCs still used by corporations. 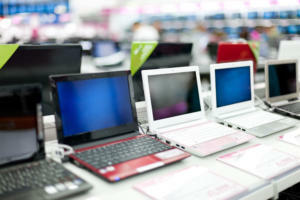 Microsoft would introduce the Windows GUI for PCs a few years later.